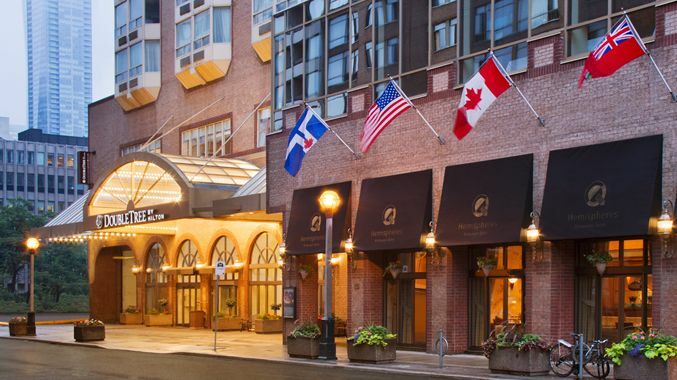 Set in the center of Toronto's financial, government, research, medical, education and shopping districts, DoubleTree by Hilton Hotel Toronto Downtown offers a quiet retreat in the heart of a vibrant, urban location. Perfect for business travelers, this Toronto hotel is within walking distance of major corporations and businesses including the US Consulate, Diplomatic and Canadian and other Government offices, major banking and legal institutions and scientific research and world-class medical centers. Leisure guests enjoy easy access to the city center and hotel events packages for Toronto attractions including The CN Tower, the Hockey Hall of Fame, Royal Ontario Museum and Ripley's Aquarium, Nathan Philip Square and Yong-Dundas Square. The hotel features stylish and spacious guest rooms, all offering modern amenities and thoughtful touches. Stay connected with internet access or watch movies on the flat-screen TV. Spoil yourself in an elegant junior one-bedroom suite with full kitchen, extensive living space and upgraded amenities. Dine in the tranquil setting of Hemispheres Restaurant & Bistro or well-known Asian inspired, Lai Wah Heen. Work out in the complimentary 24-hour fitness center, swim in the heated indoor pool or relax in the sauna or stay connected with the 24-hour business center. Host a business, wedding or social event in 13,000 sq. ft. of flexible conference space. Access their Made Market off the Lobby for light refreshment available 24-hours. The special room rate of $170.82 USD has been established to make your reservation process easy. Simply call 416-977-5000 and give the group name IQPC. You must make your reservation no later than July 2nd, 2018. For your convenience, the special rate has been extended to three days before and after the conference. IQPC has been made aware that a service provider called Exhibition Housing Management has contacted a number of individuals who are attending SSON, quoting the event, to offer hotel reservation services. Please note that Exhibition Housing Management does not represent IQPC or SSON, nor have we authorized them to use our names or trademarks on information they send out to exhibitors. While we do not know enough about this third party’s intent, we recommend you reserve rooms with hotels listed on the conference web site. •	If you receive a phone call from someone wanting to speak to the “tradeshow coordinator or the person who is handling SSON that your company is attending,” it is a scam and they are not affiliated with IQPC.